Lincoln is an historic unincorporated village in the Loudoun Valley of Loudoun County, Virginia, located approximately 1.5 miles (2.4 km) south of Purcellville. It was established as the community of Goose Creek during the 1750s by Quaker settlers and renamed Lincoln after the president shortly after his election. Lincoln is home to many stately homes, the Goose Creek Friends Meeting House and Goose Creek Historic District, the Glebe of Shelburne Parish, and an historic Quaker cemetery. The village is surrounded by and included in the Goose Creek Historic District. Whether you are living in and around our historic village or you are just planning a visit, I hope you appreciate the small town atmosphere and the great sense of history of our Village. As president of LCL, I enjoy bringing our neighbors together at events organized throughout the year. From the annual July 4th parade to Christmas caroling, our Village thrives on the wonderful sense of community that makes Lincoln such a special place. One of my goals, along with the LCL Board, is to reach out to all Lincolnites and increase participation from a broader range of established and newer residents in the area. Looking at the attendance at our events over the past few years, I feel that those goals have been successful. But we cannot keep up with all the newcomers arriving or the old timers leaving without the help of neighbors and friends. Please make greeting new neighbors and saying goodbye to those leaving one of your priorities - ad let Ellie Daley know of any changes in your neighborhood. Please feel free to contact me should you want to get more involved in LCL or if you have any questions. The below is information provided by the Loudoun Historic Village Alliance of which Lincoln is a member. The alliance encourages citizens either write (e-mail) the BOS, come to the public sessions to either speak, or just to let the BOS know of the citizens interest in the plans for Loudoun’s future. Loudoun County’s new Draft Comprehensive Plan, which will guide county growth for the next 20 years, is now before the Board of Supervisors, which has 90 days to take action on it. It's vital that citizens, as the primary stakeholders in the revision process, once again make clear their desires for Loudoun’s future, both in protection of what we value and in services we enjoy. This final document will affect all aspects of our daily lives for the next decade: our commutes, our neighborhoods, our schools, our leisure time--in short, our quality of life. Despite a strong majority of citizens stating the current rate of development is too much and too fast, the proposed Draft Plan will add 28,496 more houses—a 57% increase—than the current Plan (which already allows for about 30,000 new homes). It doubles the number of homes proposed for the Transition Policy Area—and even annexes portions of Western Loudoun (the Rural Policy Area) into that new dense housing area. It also weakens protections for our villages, waterways and water supply, open space, and the historic landscapes vital to our $1.8 billion annual tourism economy. For the past 18 years, Loudoun's annual population growth rate (at 5.1%) has been triple that of the entire D.C. metro region (just 1.5% per year). A 57% increase in housing units translates to a consequent loss of farmland and open space, vastly increased traffic, and huge new infrastructure and services needs (including 13 new schools)—at the same time that the county is spending a smaller and smaller proportion of its budget on those necessary services. (A recent example: the BOS just removed funds for a new library for the Academies of Loudoun to pay for roads.) And for every $1 received in residential taxes from those new homes there is $1.60 in services needs. This continued extreme rate of growth pitts the desire for low tax rates against the need for quality services, maintenance of hugely expanded infrastructure, and servicing the debt to pay for it all. This growth pressure directly threatens our rural values, rural villages and our quality of life—as well as the future financial stability of Loudoun. Write each County Supervisor. Speak your mind at Board of Supervisors meetings—most especially the (just) two public hearings scheduled on the Plan. The BOS can make any changes they deem important to the Draft Plan now in front of them. Make sure they put Loudoun citizens’ needs first. 9 a.m. Saturday, April 27. Loudoun County Public Schools Administration Building, 21000 Education Court, Ashburn. Call in advance to sign up to speak (starting at 8:30 a.m. Friday, April 4). 703-777-0200. Thank you to everyone who came out to our Annual Meeting. If you have any additional concerns, please reach out to us! Lincoln’s annual July 4th Parade and gathering was fun for all! Our Village was treated to musicians, animals, singers and just a lot of adorable and fun participants! Many thanks for all those that made the effort to share and march through the Village! The parade was followed by a special performance of Lincoln Elementary students singing two patriotic songs and the annual reading of the Declaration of Independence. Lincoln residents brought ample food to share with neighbors and friends, as folks ate and enjoyed the wonderful music of the Plank Stompers. 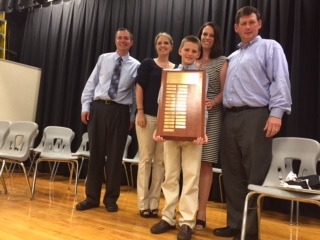 Each year since 1989, the Lincoln Community League has honored one graduating fifth grader who has excelled in academic achievement and leadership, while showing consistent kindness to all members of the Lincoln Elementary School family. Congratulations to this year's winner Ryan Palmer! On Saturday, April 4th the rain stopped just in time for the annual LCL sponsored Egg Hunt. Over 30 children were in attendance! Our parent volunteers hid hundred of eggs while the kids played traditional spring games such as Peep toss, hopscotch, egg & spoon race, and sack relay. Friends and neighbors chatted over coffee and delicious treats, including Jean Brown's famous bunny cake! Prizes were awarded to those who found the six gold and silver eggs, plus a jar full of jelly beans to the winner who came closest to the 274 count! Thank you to all our volunteers and participating families for helping to keep our village traditions alive!